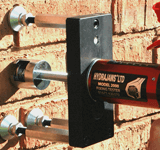 Our pull out testing service provides expert hydraulic tests and shear testing on anchor bolts for clients throughout the whole of the UK, as well as London, Hertfordshire, Surrey, Berkshire. Hampshire, Essex and Kent. An essential on site fixings test and stress testing throughout the construction industry ideally applied to anchor bolts to determine load capacities and ensure the safety and reliability of an anchor for whatever you want to use it for. As one of the UK's leading pull out testing companies, we are also specialists at providing Bond Testing and Shear Testing alongside our Pull Out Testing services. Our shear testing team have years of experience fitting anchor bolts and testing them and provide a professional service which gets great results and reports in detail on all the information you need, making sure that your site complies with the Health and Safety Regulations. Southern Drilling Ltd is a Construction Fixings Association-Approved Tester. Call now for a free survey! For fast, accurate and reliable shear testing and pull out testing, call Kent and London's experts at Southern Drilling today. Speak to our specialist team on 01474 822785 and arrange your free survey and no obligation quotation. We'll utilise the very latest technology and the experience and expertise of our talented team to provide a quick and accurate analysis of the problem. Providing a mechanical method to quickly expand a sample size and detail whether you have a freak breakage or a more serious problem with the design or materials, stress load testing is often called for when anchor bolt problems are reported. Applying the same stress loads to a range of different anchor bolts, we can help to quickly identify the problem and find the most suitable solution. Similarly, we can apply the same techniques when carrying out Shear Testing too. Stress tests and shear testing is only useful if it produces information you can work with and ensures you meet any relevant Health and Safety regulations. We provide all the paperwork and reporting essentials to meet best practice and ensure you’ve got all the information you need to make the right decision. Our shear testing reports detail the performance results of different anchors bolts tested alongside details of the stresses applied and the load capacities and our experienced team can provide advice and recommendations based upon them. Direct tensile or bonding strength between two layers is important if repairs to concrete structures or additional overlays and screeding on existing concrete is to be structurally sound. The bond test is a means of testing the bond between concrete and other materials. A measured force is applied to the bonded materials if the bond is greater than that of the material under stress it will fail. A widely skilled shear testing team and investment in the best equipment and training helps us to provide our customers with more than just our diamond drilling speciality. We provide a comprehensive range of specialist construction services to the industry as well as comprehensive controlled demolition packages throughout London, Kent, Hertfordshire, Essex, Sussex, Surrey, Berkshire and Hampshire and across the whole of the UK. So whatever your bond or shear testing requirements, put them in the hands of the experts here at Southern Drilling. Contact us today for a free and no obligation quotation at your convenience. We specialise in the provision of expert pull out testing services to commercial and industrial clients across the UK. Our experienced and highly skilled team have recently completed pull out testing for clients in Bromley, Hastings, Chatham, Hemel Hempstead, Canterbury, Basildon, Gillingham, Chelmsford, Dover, Southampton, Faversham, Portsmouth, Stevenage, Maidstone, Slough, Tunbridge Wells, Ashford, Croydon, Beckenham, Orpington, Dartford, Colchester, London, Tonbridge and Rochester.